This is one recipe that definitely makes the cut. I got the idea from Ina Garten – the Barefoot Contessa is a wealth of inspiration for the home cook. I couldn’t find the exact recipe, so I just made it up – niçoise is niçoise, anyone who knows anything about food could probably throw one together. The difference in this version is Israeli (or giant) couscous. It’s less starchy and more filling than potatoes – probably because I only add two or three small potatoes in an effort to be carb conscious and then inevitably wish I had five or six. It also soaks up the mustard vinaigrette really well, but stays moist so you don’t feel like you’re chewing on cotton. Although they’re both made out of durham wheat, it’s easier to pretend that regular couscous (made from crushed durham wheat) is more of a grain than a pasta, but there is no mistaking the pasta-type bite of these plump little pearls (made from semolina flour) and ultimately I think that’s why this is so satisfying. It wouldn’t be the same with penne or fusilli or any other pasta you might use for a salad. Orzo could work, or pearl barley if you’re trying to eat more grains, but giant couscous was gigantically successful if you ask me – and by reading this I’m afraid that’s exactly what you’re doing. 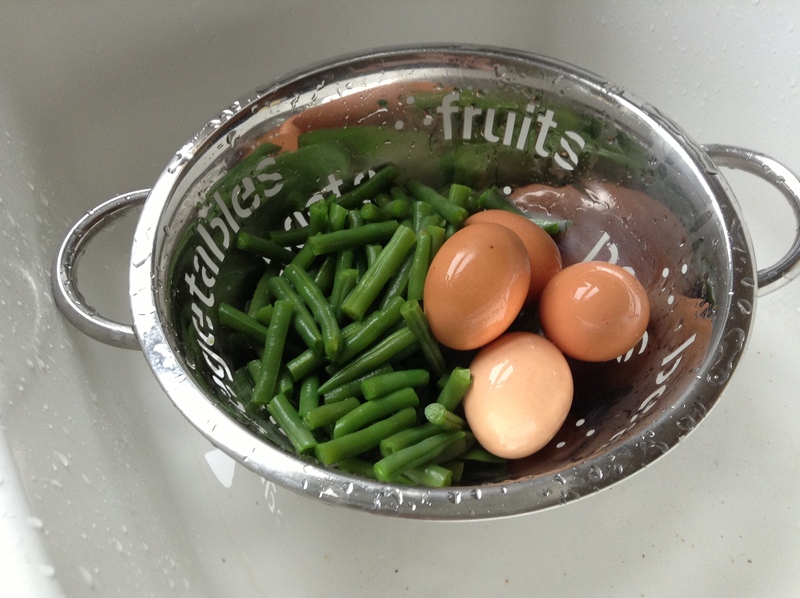 The other ingredients are pretty standard: blanched green beans (they should technically be raw, but I prefer them al dente), tomatoes and boiled eggs. I leave out olives because the mister doesn’t like them, but by all means use them in yours. The ultimate success of this salad and the reason for its lasting stay on restaurant menus worldwide is its contrasts in flavors and textures: crunchy, fresh green beans, juicy, sweet tomatoes, silky, moist tuna, sharp, spicy mustard vinaigrette and salty olives (or salty, sour capers in this case). All bundled in with rich eggs and velvety potatoes (or tender pearls of pasta joy). You’ve got carbs for energy, protein for staying power and vegetables packed with goodness. What more do you need to get you through the afternoon? 1. Cook couscous to package instructions. 2. Meanwhile, make vinaigrette and toss all ingredients in it (separately or together). 3. Toss couscous with vinaigrette and mix in vegetables. 4. 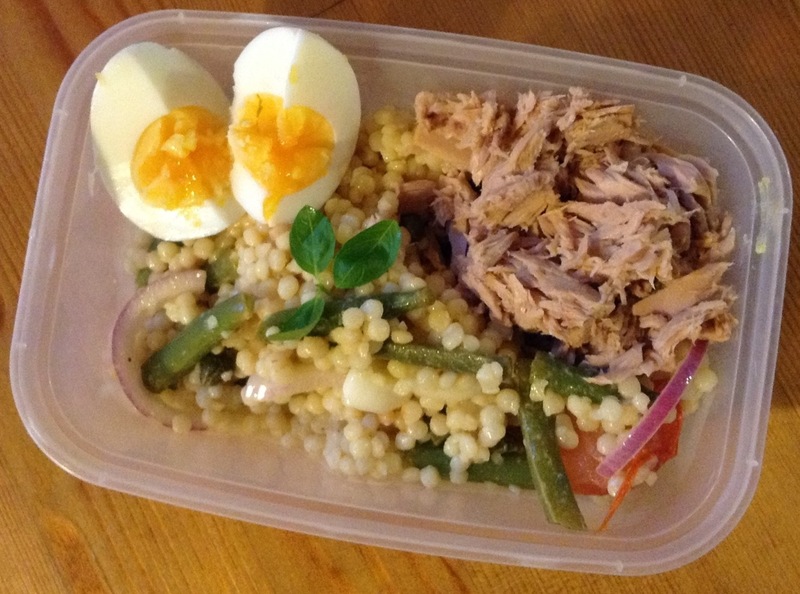 Arrange salad in containers and top with tuna and slices of egg. Garnish with parsley, dill or basil. Or Tupperware. 🙂 thank you though! Sounds delish and looks yummy! Even in the plastic container! Keep up the nice blogs! Lunches are so hard, and this looks like a delicious one! Thanks! It’s really good. We made a big batch on Tuesday night and so far they’ve been excellent each day! This is a great lunch idea! I’m always working to find new “hearty” lunch salads – something that will stand alone…. It definitely does and it helps that it’s tasty so you don’t feel deprived of good things.